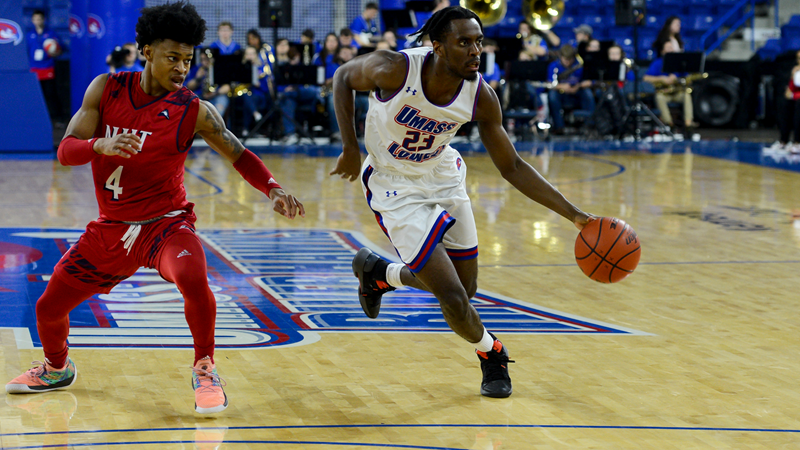 The UMass Lowell men’s basketball team (5-5) won their debut game at the Tsongas Center on Saturday defeating the visiting New Jersey Institute of Technology Highlanders (7-2) with a final score of 94-71. Redshirt junior guard Christian Lutete led all scorers with a team and season high of 28 points and nine rebounds. The River Hawks were engaged from the initial whistle with sophomore guard Obadiah Noel coming up with a block on the very first possession. It was a competitive contest to start as the NJIT Highlanders took the lead 13-11. This lead, their only lead the whole game, would only last the visitors 10 seconds as senior co-captain forward Josh Gantz would answer with his own three. The River Hawks never looked back. The defensive effort caused the Highlanders to shoot 32 percent from the field and an abysmal 20 percent (2-10) from three-point range in the first half. Freshman guard and Lowell native, Alex Rivera, came off the bench and produced instant offense for the hosts. After the Gantz three, he would tally the next eight points for the River Hawks. The momentum carried on with sophomore guard Obadiah Noel as he forced the visiting guards into turnovers. Turnovers that turned into back-to-back slams for Noel as the Tsongas Center erupted. He gave the River Hawks their biggest lead in the first half at 16. A late Highlanders run would see the hosts with a lead of 37-26 at halftime. Senior co-captain guard Ryan Jones would get the River Hawks right where they left off with a mid-range jumper to begin the second half. But his most important bucket of the game would come via three-point range as the Highlanders had cut the lead to 10 with 16 minutes to go in the game increasing the River Hawk lead to 13. Those lucky enough to sit at half court could just see and hear the type of swagger the hosts were beginning to play with. Guards Lutete and Rivera came out firing finding good shots through the River Hawk’s impressive ball movement. As the hosts increased their lead, they lead by as much as 25 at one point in the second half, their intensity did not escape them. Some highlight effort plays included senior guard Jones saving a loose ball and freshman guard Rivera chasing his missed three-point shot. Both plays came with the River Hawks leading by at least 20 points. The River Hawks finished the game outscoring the opposing bench 21-14 and having five players in double digit scoring. The hosts held the ball as the game clock ticked double zeros to give them an impressive 94-71 over the NJIT Highlanders. The River Hawks will continue their season this Tuesday, Dec. 4 at 7 p.m. as they visit the Boston University Terriers. The River Hawks will return to home play on Friday, Dec. 7 at 7 p.m. at the Tsongas Center as they host Maine Fort Kent.